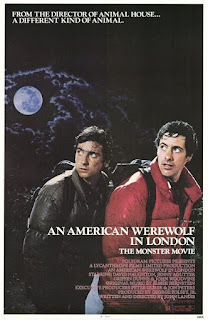 The majority of horror fans seem to think that the competition for Best Werewolf Movie Ever comes down to two films, both of which were released in 1981: Joe Dante's The Howling and John Landis's An American Werewolf in London. I'm not sure if the original The Wolf Man is being factored into this competition, or whether we're meant to differentiate between "wolf man" movies and "werewolf" movies, but if a group of horror fans are asked what the best werewolf movie is, odds are that The Howling and An American Werewolf in London are going to be the two films mentioned most often. 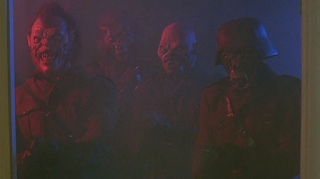 The werewolf sub-genre is bogged down with a lot of sub-par entries, like a good portion of the Howling sequels, and while The Howling and American Werewolf don't quite make it into my personal top two, they do stand out as a couple of the best films dealing with werewolves. 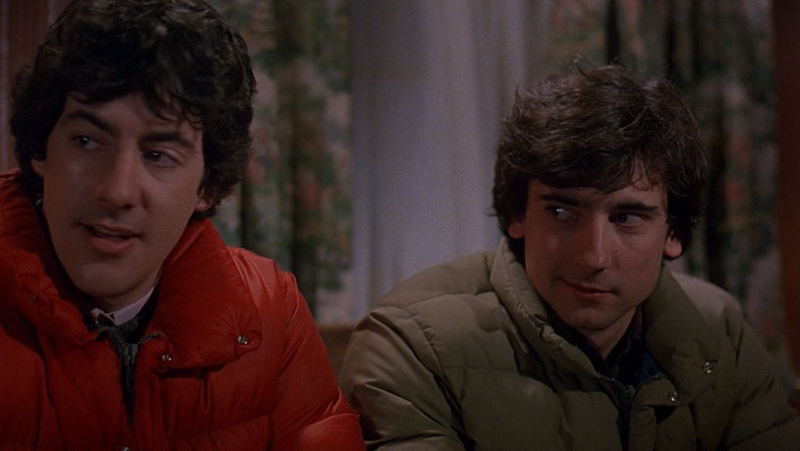 American Werewolf doesn't rank quite as highly on my list (a list that doesn't actually exist, I have to admit) as it does for other fans because I have issues with the pacing. Things do get off to a great start, introducing us to Americans David Kessler (David Naughton) and Jack Goodman (Griffin Dunne) as they reach a strange, remote location in the moors of England during a backpacking trip. David and Jack are a lot of fun to spend time with as they banter and joke and awkwardly interact with the employees and patrons of a pub they come across that's called The Slaughtered Lamb. Everyone there is quite standoffish, and they won't tell the Americans why they have a five-pointed star, which Jack recognizes (thanks to Universal Studios and Lon Chaney Jr.) as the mark of the wolfman, drawn on the wall with candles burning on both sides of it. Perhaps to ward off monsters? There is a monster in the area, as the Americans find out when they're sent on their way with the warning, "Stay on the road. Keep clear of the moors. Beware of the moon." With the full moon shining in the sky, the pals unthinkingly wander off the road and across the moors, where they're soon attacked by a vicious creature. Jack is killed and torn apart, David is wounded, and when locals shoot the beast, it collapses to the ground, dead, as a naked man. After this masterful 17 minute opening sequence, American Werewolf pumps the brakes a bit, focusing on the time David spends recuperating in a London hospital and developing a romantic relationship with nurse Alex Price (Jenny Agutter). 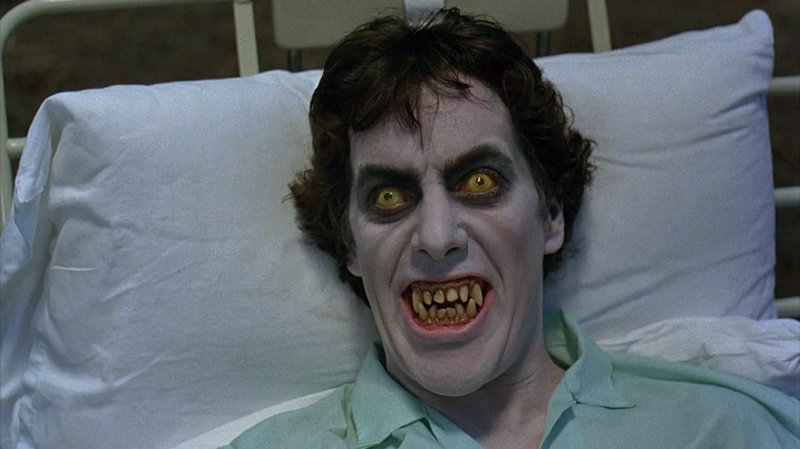 It will be a long wait before we see any more werewolf action, but Landis attempts to hold our interest by having David experience some very strange dreams during his hospital stay. David dreams that he's running through a forest, that he kills and eats a deer, and that he becomes a fanged, hideous monster, dreams which make perfect sense for someone who is now cursed with lycanthropy. But my favorite is a dream that makes no sense at all. 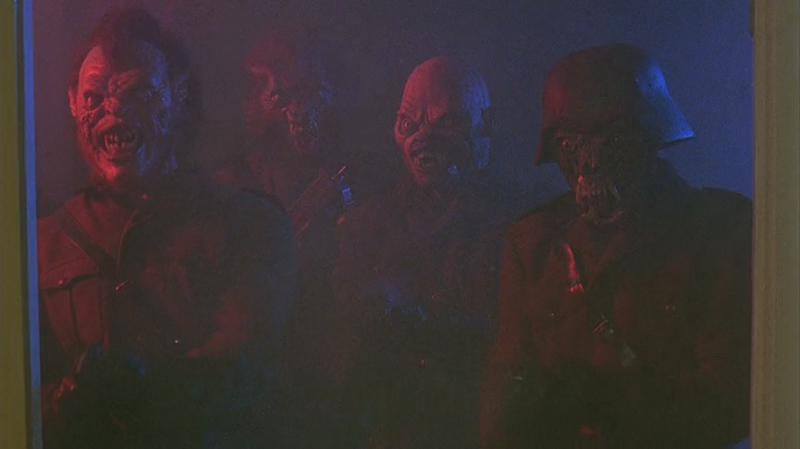 In one scene, David dreams he's at home with his family when a quiet night in watching The Mupper Show is disrupted by the arrival of a troop of monsters wearing uniforms reminiscent of World War II German uniforms and toting submachine guns. These monsters shoot up the place and torch it in a moment of complete randomness. This dream and another patient Alex deals with, a bratty little boy named Benjamin who answers "No" to everything with a big smile on his face, keep me involved when the film is moving a bit too slowly for my taste. David and Alex don't move slowly. Once he's healed up, he moves straight from his hospital room into her flat, which he's able to do because not a single member of his family came over from America to visit him while he was in the hospital. I have never understood why. David isn't estranged from them, he calls them and tells them he loves them. He has been attacked and hospitalized, his best friend murdered right beside him. I don't get why nobody comes to see him. The only person who visits David is the spectre of Jack, mutilated and swiftly rotting. It's Jack, trapped in limbo because he died an unnatural death, who informs David that he is now a werewolf... and worse, that David has to die for Jack to ever be able to rest in peace. The werewolf's bloodline has to be severed, the last remaining werewolf (David) destroyed. If David doesn't kill himself, he will become a werewolf and kill others, and they'll be trapped in limbo, too. That's exactly what happens. More than forty minutes after the attack on the moors, about an hour into the film's 97 minutes, David finally undergoes the painful transformation into a werewolf, a transformation brought to the screen through mind-blowing special effects work by Rick Baker. 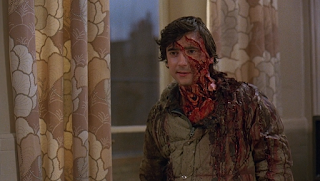 This transformation is the thing American Werewolf is most remembered for, and for good reason - whether or not the pacing for the film works for me overall, there is no doubt that this display of special effects, combined with Naughton's portrayal of David's anguish, is one of the greatest moments in horror history. 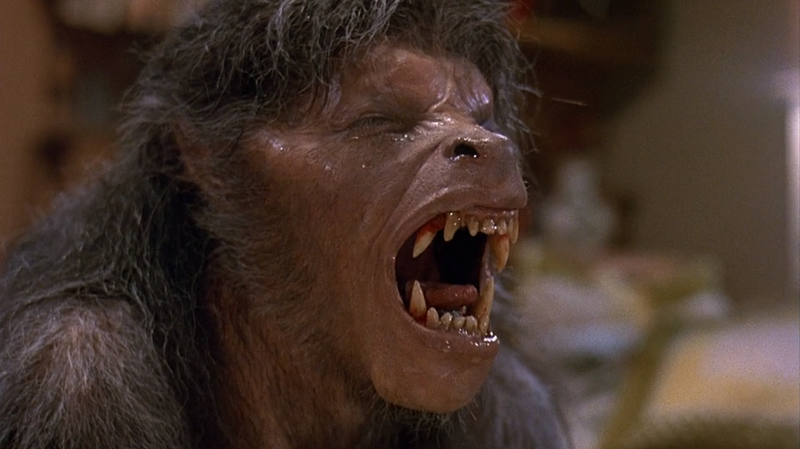 The werewolf David becomes isn't one of my favorite designs (my favorite werewolf design is in The Howling), but this is the best werewolf transformation. Once David is a werewolf, Jack gets company in limbo, and David has more restless souls telling him he needs to die. 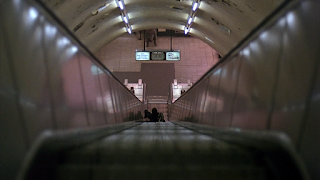 The kills aren't much to write home about, although there is a good stalking sequence in the Underground. I just don't feel like the time we do get with the werewolf is worth the amount of time we spent waiting for David to turn into the creature. After the night of terror and murder, David wakes up naked in the zoo, feeling great. His spirits will have crumbled by the end of the day, as the second night of the full moon descends into tragedy. 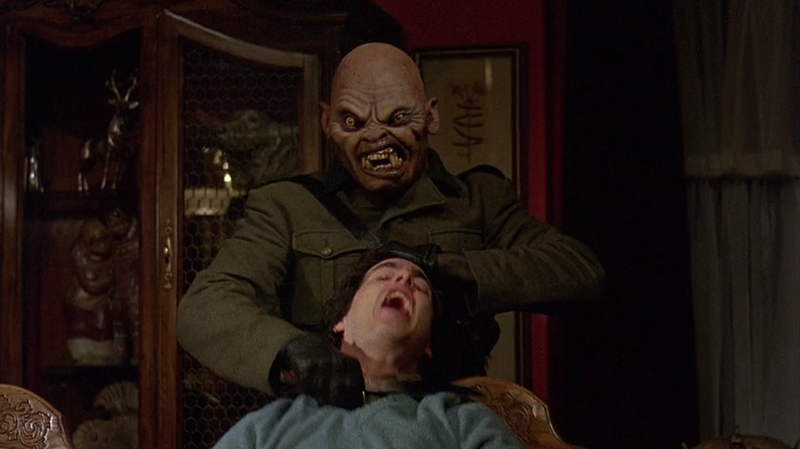 One reason why I wouldn't rank American Werewolf as my favorite or second favorite werewolf movie is that I feel the elements around the werewolf overshadow the creature itself. The movie has a strong sense of humor, as you would expect from the director of Animal House and The Blues Brothers, and the comedic banter between David and Jack is wonderful. The idea of a werewolf being haunted by the spirits of its victims is also great. That monster soldier dream is some delightful madness. The transformation is classic. The werewolf... it takes too long to show up, its attacks are lackluster, and I'm not into the design. An American Werewolf in London is a film that I enjoy, despite the middle stretch starting to drag, and I respect its place in horror history. It's rated more highly in general than I would rate it, but I'm very glad it exists.